Flickr of Inspiration- Ride a bike! What the HAY? !, originally uploaded by Olive Talique. 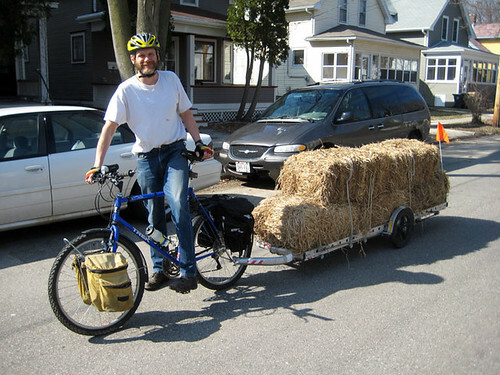 The man in the above photo is delivering hay to a community garden. What a great use of a bike with a trailer! Riding bikes can be really fun. Using them for chores can make that fun too. Check out our Flickr Gallery here. My husband always bikes or walks to his community garden in town. One day he was on foot carrying a very old piece of lumber we removed from our garage, and the cops stopped to question him. I still can't believe it. Did he look like a thief, stealing a piece of wood. Cops have nothing better to do. They're sure not stopping people in cars on cell phones, or speeding on streets where people are walking. Oh yes, it still makes me crazy, even though Tom finds it funny!!!!! I'm going to break out my bike tomorrow after work and head down towards the abbey and back. I really need a good trip outdoors. Dog Island Farm is a small urban farm in the San Francisco Bay Area.